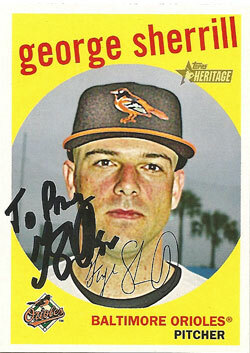 Until last year’s marathon All-Star Game, I’d never heard of George Sherrill. I don’t follow American League baseball very much, and there hasn’t been much reason to pay attention to the Seattle Mariners or Baltimore Orioles lately. And that’s too bad, because George Sherrill has a great story. He didn’t get drafted out of high school or college. Instead, he had to work his way into affiliated baseball by another route. On the eve of the first games of the Grapefruit League season, I received another envelope from a Florida spring training camp. 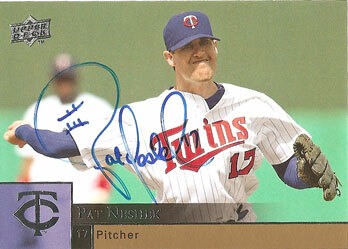 Pat Neshek of the Minnesota Twins has to be one of the most hobby-friendly players to ever play the game. 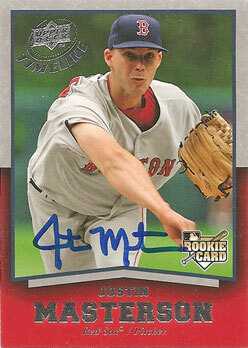 He signed my first 2009 Upper Deck base card of the year. He also sent me a New Britain Rock Cats 25th anniversary card in exchange for a couple of cards I sent to him for his collection. Monday brought a full mailbox, with four more cards from Florida spring training camps. 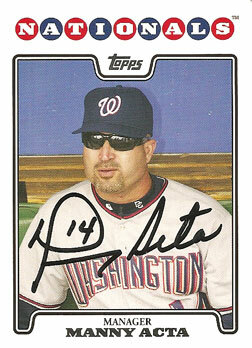 Former Mets coach and current Washington Nationals manager Manny Acta has an unusual signature. I don’t have any problem reading his last name, but I’m not sure how you’re supposed to decipher the squiggles to make up his first name. But that’s ok… I’m sure Acta will be left scratching his head alot this year too, considering his team. After a couple days of junk mail filling the mailbox, I got three more envelopes from Florida and my first two from Arizona today. 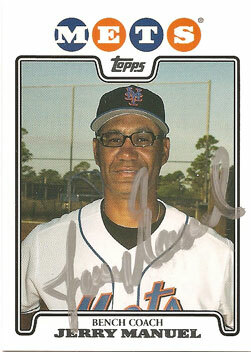 The highlight was this Jerry Manuel card, signed in silver Sharpie. Manuel did a good job handling the mess he inherited last year and I’m very interested to see how things go this year when he starts with a clean slate. We’ve got a little more than a month before the calendar says it’s spring, but every baseball fan knows that spring really starts the day pitchers and catchers report to spring training. A few days ago, I mentioned that I’ve sent out around 60 autograph request letters to players and coaches at spring training this year, and today I got my first response. 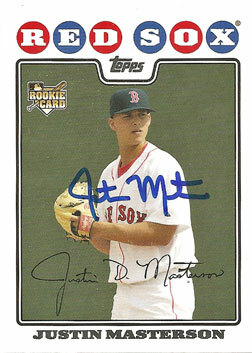 Justin Masterson is a modern rarity… a Red Sox player who will still acknowledge fan mail. 🙂 As a rookie last year, he went 6-5 with a 3.16 ERA. He split time between the starting rotation and the bullpen last year, but it seems likely he’ll be a reliever if he makes the team this year.